Brig. Gen. Carl Schaefer, 412th Test Wing commander (left), and new U.S. Air Force Test Pilot School commandant, Col. Ryan Blake, pose with the school’s guidon during a change of command ceremony in Hangar 1207, July 10, 2018. 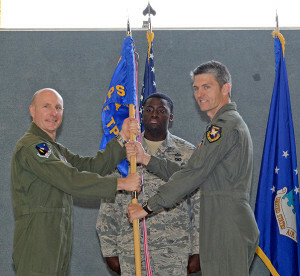 Col. Ryan Blake took the helm as the new commandant of the U.S. Air Force Test Pilot School at Edwards Air Force Base, Calif., during a change of command ceremony held in Hangar 1207, July 10. As commandant of TPS, Blake will drive the school’s strategic vision, set organizational objectives and direct a $32.5 million budget overseeing the day-to-day operations of the world’s premier test pilot school. Blake graduated from TPS in December 2008 and is both a seasoned combat pilot and test pilot. 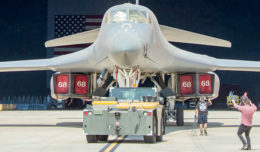 He previously served as the 96th Operations Group commander at Eglin Air Force Base, Florida, and before that was a test pilot and flight test squadron commander. He is a command pilot with more than 2,400 military flight hours in 44 aircraft types as an experimental test pilot, instructor pilot and evaluator pilot. 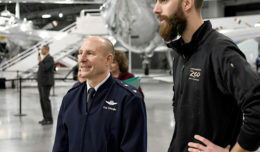 “When you look at the wall (of former commandants) in the schoolhouse, you see household names like Chuck Yeager and Buzz Aldrin…to be selected as the new commandant is very humbling,” Blake said. Col. Matthew Higer, who served as commandant for the past year, is moving on to become a wing commander at another base. Since 1951, the school at Edwards AFB is where the Air Force’s top pilots, navigators and engineers learn how to conduct flight test and generate the data needed to carry out test missions. Human lives and millions of dollars depend upon how carefully a test mission is planned and flown. The comprehensive, one-year curriculum of TPS is fundamental to the success of flight test and evaluation, according to the school. Upon graduating from TPS, graduates receive a Master of Science Degree in Flight Test Engineering.